VANCOUVER–"The oil sands have moved from the fringe to the centre of energy supply," notes the report "Growth in the Canadian Oil Sands: Finding a New Balance," released by IHS Cambridge Energy Research Associates (CERA) on May 18. Environmentalists and some aboriginal groups want the oil sands to stay on the fringes because extracting heavy oil produces more greenhouse gas emissions than conventional crude. On May 22, the Council on Foreign Relations (CFR) issued a report entitled "The Canadian Oil Sands: Energy Security vs Climate Change," which argues that the negative environmental impacts and benefits to US energy security from Canada’s tar sands are both overstated. "Smart regulation can place a fair and reasonable price on the oil sands’ greenhouse gas emissions, providing the right incentive to reduce them," said Michael Levi, an author of the CFR report. In a phone interview, Levi said lifecycle greenhouse gas emissions from the tar sands are 17 per cent worse than conventional US oil imports. 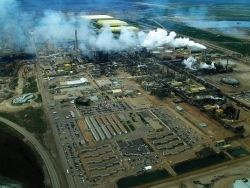 Environmentalists dispute this claim, stating oil production from the tar sands is at least 300 per cent worse than conventional oil. "The development of Canadian oil sands encapsulates the complexities that the world faces on energy, environment and security," said IHS CERA Chairman Daniel Yergin. Yergin won a Pulitzer Prize for his book The Prize: The Epic Quest for Oil, Money and Power , which details the history of the oil industry. CERA did not respond to interview requests. Oil today accounts for 35 per cent of the global energy supply—the largest share of any form of energy. In 2008, worldwide oil demand was 85.2 million barrels per day (mbd). CERA estimates global oil demand in 2035 could range from 97 to 113 mbd. If the global economy stays in recession or a slow-growth scenario, production from Canada’s tar sands will reach about 2.3 mbd by 2035—an increase of about one mbd from present levels—according to CERA's report, which posits three possible scenarios for the future of tar sands development. In a high-growth scenario, the figure will reach six million mbd. In 2008, Canada supplied the US with 19 per cent of its oil imports. That figure could rise to 37 per cent by 2035, according to CERA. Canada's dependence on oil exports to the US worries Gordon Laxer, Professor of Sociology at the University of Alberta. "We need 21st-century public interest ownership [of oil reserves]," he said in an interview. Relying on exports to the US rather than the domestic market puts Canada in a weak position if there is a supply crisis, warned Laxer. Unlike the US, Canada does not maintain a strategic petroleum reserve. In contrast to Canada’s private ownership structure, the vast majority of world oil reserves are controlled by government-owned companies which can, in theory, use oil wealth to finance national development, according to Laxer. While arguing for a price on carbon emissions, the CFR report is not concerned with other environmental problems, including water contamination. "Local impacts are not the concern of US policy-makers," said Levi. Environmentalists say that exponential increases in water extraction from the Athabasca River could destabilize the North American water cycle. Most water used in tar sands extraction is not returned to the natural water system. Instead, wastewater containing toxins is dumped into what the industry calls tailings ponds. As outlined in CERA’s report, Staten Island, New York, could fit inside the tailings pond operated by Syncrude, the largest tar sands consortium. "It takes a huge amount of energy just to melt the tar sands and then you have to use a huge quantity of water: that's a cost which has to be internalized [by industry]," said environmentalist Dr. David Suzuki. Environmentalists like Suzuki, along with some economists, believe industry should pay for the water it uses and the air it pollutes. With these costs, the economic viability of tar sands development would be questionable. "Right now the oil industry is getting away scot-free," said Suzuki in an interview. The CFR report supports adding a cost or externality to carbon emissions. The report estimates that a carbon price of $20 per tonne of CO2 equivalent—the average price in the European Union's Emission Trading Scheme—would add only $2.21 per barrel to production costs of the oil sands. "The US will have a large market for emissions; Canada will benefit from that stability," said CFR’s Levi, extolling the benefits of a carbon pricing system that is being debated by legislators on both sides of the Canada-US border. Environmentalists say these cost estimates for carbon are too low to stop runaway climate change, a scenario many scientists agree would destroy life on Earth as we know it. CERA maintains a list of the world’s top 15 countries that have the potential to increase oil production over the next decade. Canada ranks fourth and Brazil is the only other country in the Western Hemisphere to make CERA’s list. Critics of CERA’s methodology say this accounting neglects Venezuela’s massive and virtually untapped heavy oil reserves in the Orinoco belt. A version of this article appeared on Inter Press Service. The author is currently studying rural opposition to oil development and sabotage in Canada. He can be reached at arsenault_chris@hotmail.com. Submitted by macdonald on Sun, 2009-06-28 14:32. CERA should never be considered an authority on anything. They are nothing but what amount to a giant investment encouragement unit that is based on giving the most rosy picture possible as per global oil reserves. They are, much like Exxon when it comes to global warming, the only remaining "serious" deniers of the reality of peak oil. Even the US Department of energy has come out of the woodwork on this understanding. When CERA talks about global forecasts of oil demand, they do not take either realistic numbers for other countries reserves, nor the cumulative effect of what it means for these remaining "oil" sources to be ramped up. They take Saudi projections at face value, but Saudi Arabia's stated reserve numbers-- in a country more explored than an empty cupboard by a mouse in winter-- fluctuate in tandem with what would be best for global oil prices. There is no outside verification. The same can be said about many other nation-states and their stated reserves. North Sea oil is irrevocably in decline. So is the massive Cantarell field in the Gulf of Mexico, after only a short time of production. We are globally using over 9 barrels for each one found. Per capita consumption wise-- a not-very-capitalist measure, but one based on physics-- we hit peak oil globally in the 1970's. The international energy agency had a report leaked only a few months ago where they let it slip that they are already-- when economic demand for development is at a "normal" pace-- are in the neighborhood of ten million barrels a day shy of demand for petroleum, et al. Both David Suzuki and his namesake foundation do not believe that challenging the rights of capital is possible. They are not environmentalists, but "sustainable-ists", writing fantasy to make people feel more personal comfort while continuing to live a lifestyle that has already hit the wall. I would hope in the future, to counterbalance their corporate PR, we don't give Wal-Mart consultants who endorse Gordon Campbell as "environmentalists" space, but instead talk to real environmentalists who know that "making the producers pay" amounts to commodifying the atmosphere and puts false hopes in the ability of capitalism to survive without oil. Buying the water and c02 permits is no solution to the ecological crisis and more importantly condemns to death communities like Fort Chipewyan-- never mind the entire Mackenzie River basin. Mr Laxer means well, but all these nationalist responses being promoted are the antithesis of any real environmental justice and should be seen as such. The problem is not Canada vs the US, or "responsible development" vs business as usual, but one of North America vs Turtle Island-- and life versus death. Submitted by macdonald on Sun, 2009-06-28 14:44. This is a link to an important article, responding to CERA from the Energy Bulletin and a founder of ASPO-USA. They are making projections that, if we give them credibility in any way, will basically condemn humanity (and a lot more life forms) to something resembling extinction. Guess I'm one of them "alarmists", eh?